I’ve made a new blog (at rocksandwater.net) where I will be blogging in the future. That was the URL for this blog, but I’ve changed this one to its current address so that I can use the old URL, and still have this one up. I am slowly duplicating all of the content on this site to that one. The reason for doing that is a move to static blogging using Pelican (a Python package) instead of wordpress, which will give me a lot more control over the blog, and allow me to put more dynamic content in the blog. This is a quick test to see how easy it is to render mathematical text in the wordpress blog, and how the different methods look. First I am going to try LaTeX directly. Today’s M8.6 strike-slip earthquake off the Sumatran coast is an incredible event for a number of reasons: First, it’s (as far as I’m aware) the largest recorded strike-slip earthquake. Second, it’s an intraplate earthquake–although it is about a hundred kilometers from the Sumatran subduction zone, where the catastrophic 2004 M9.1 earthquake occured), it’s not a plate boundary rupture. However, the stresses resulting from incipient subduction or the effects of the 2004 event likely loaded the fault responsible for this event. This may also make it the largest reported intraplate earthquake, but I’ll have to check on this. And third, with a centroid depth of 22 km, this is a dominantly mantle event, as the crustal thickness in mature oceanic plates is typically ~7 km. Since the energy released from an earthquake scales not simply with the along-strike length of the rupture but the total fault area, it’s possible that the great magnitude of this event is a result of a very broad vertical, as well as horizontal, rupture patch. Additionally, the magnitude scales with the strength of the rock surrounding the fault, and cold (and hence capable of brittle failure) oceanic mantle is made of peridotite and very strong. Although I have no idea what kind of surface observations are possible for this event, we may find that much of the slip and energy released occurred in the upper mantle. Well I have to board a plane, so I will cut this off here. Expect to hear much more about this event in the future, surely from Austin Elliott at The Trembling Earth if no one else. Tyler Cowen of Marginal Revolution requested writings on whether science has become overly specialized and what the ramifications of this might be. I didn’t have any of the ‘leads’ he asked for so I decided to write one. My take is largely anecdotal, and especially based on my experience. I am not familiar with any literature on the subject, although I am sure some exists. However, despite all the whining about this, I am not sure that science is getting more specialized. It is just getting more specific. First off, there is an important distinction to make: the specialization of the scientist or the specialization of a unit of scientific product. ‘Science’ itself is more of a continuum, like music or any other cultural phenomenon. There are very few real boundaries, although some parts may not mix as readily as others. Is music too specialized? While all experts have specializations, there are generally two categories of this, methodological specializations and subject specializations. The expertise for either has to be based on a very large and diverse knowledge base. I just returned from a short trip to the site of the M 7.2 Sierra El Mayor – Cucapah (Baja California) earthquake that occured 4 April 2010. The purpose of the trip was to perform a repeat Terrestrial LiDAR Scanner (TLS) survey of selected areas of surface rupture (mostly along the Borrego fault), to quantify changes to the scarp and surroundings over the past year. This project is a collaboration between UC Davis (Mike Oskin, Peter Gold and Austin Elliot), KU (Mike Taylor, A.J. Herrs, and myself) and CICESE (Alejandro Hinojosa). John Fletcher at CICESE seems to be the head of the non-TLS investigations, of which there are many. It’ll be a little while until this year’s data is processed, but here are my first observations and some photos from the trip. First off, the surface ruptures are pretty amazing. While they look generally similar to what I would have guessed, it was still fantastic to see the ground shattered like it was. A 2 meter cliff ripping across a landscape where none existed shortly before is a very exciting thing for someone obsessed with the earth to see. Preservation in our study area is also excellent. 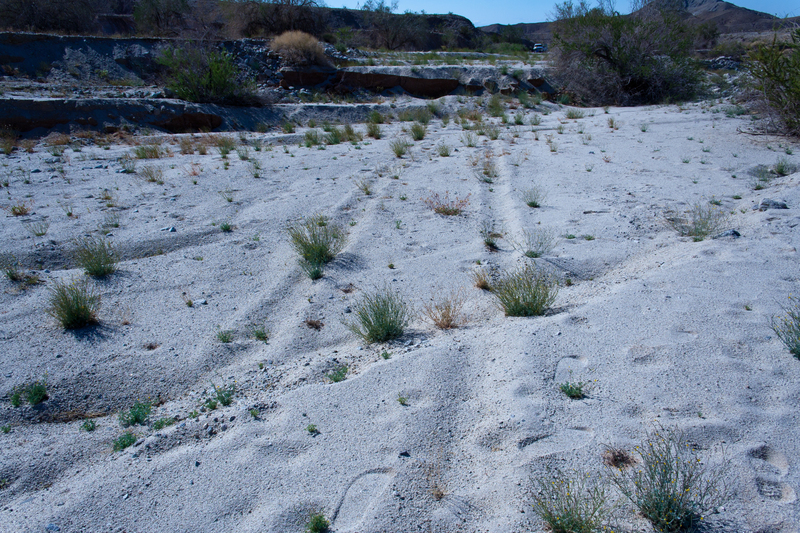 The Gulf of California rift valley is very dry, and fluvial surface modification is minimal: tire tracks cut by the fault scarps (i.e. a minimum of one year old) are still preserved. These tire tracks were cut by the surface rupture. A small scarp is in the foreground; note the dextral offset in addition to the normal offset. The tracks lead straight into the main scarps, which for some reason have blocked post-earthquake traffic. One of my favorite problems in tectonics is earthquake slip obliquity and partitioning, particularly where dip-slip and strike-slip motion are accommodated on separate faults (vs. similar slip on several adjacent structures) when stress is transtensional or transpressional with respect to the faults. Though motion at plate boundaries is almost never truly parallel or perpendicular to the plate boundaries, much of the time earthquake or fault slip is; a prime example of this is mid-ocean ridges, which are partitioned into roughly orthogonal normal fault segments and transform fault segments. This is an interesting problem because it’s a global phenomenon, happens on a variety of scales (from plate boundaries to at least field mapping scale; I don’t know about outcrop to microstructure scale), and has considerable implications for fault loading and seismic hazards. And I don’t consider it to be sufficiently explained. It does crop out in the literature now and again, and someone will throw out a new theory, and maybe look at a couple of different seismic events, and call it good, but we are awaiting a rigorous, global study. I’ve poked at this problem a bit over the past couple of years, and though I have not arrived at a solution, I have had some fun with it. I have approached it from two different standpoints. One of them is an observational approach: considering the global earthquake focal mechanism and plate boundary catalogs, and doing basic analysis (stats, etc.) on those data. The other is a theoretical approach: basic modeling of friction during oblique slip on a dipping fault vs. dip slip on a dipping fault and strike-slip on a vertical fault. For this post, I’ll stick with the observations; the modeling is interesting as well, but I need to rethink some of it before posting. Slip obliquity for all events in the Global CMT catalog, 1.1.1977-17.11.2009. Yellow events are the least oblique, red are moderately oblique, and blue are the most oblique. Topo/bathy data from CleanTopo2. Plate boundaries from Bird, 2003, G-Cubed. Several things are evident from this figure. The first is that, in general, earthquake slip is not very oblique: most of the events are yellow (less than 15 degree rake). Secondly, it is obvious that there is considerable spatial variation to the amount of slip obliquity. We can see that some plate boundaries, such as the Sumatran trench, tend to have a lot of low-obliquity events, whereas others, such as the Mid-Atlantic Ridge, are fairly oblique. 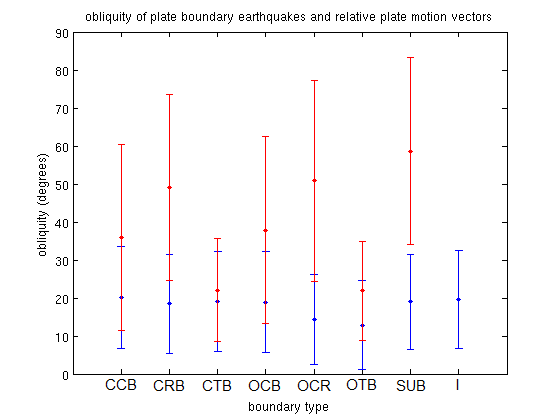 Mean earthquake obliquity (blue) and plate motion obliquity (red) at various plate boundary types. Error bars are one standard deviation. CCB = continental convergent boundary. CRB = continental rift boundary. CTB = continental transform boundary. OCB = oceanic convergent boundary. OCR = oceanic rift boundary. OTB = oceanic transform boundary. SUB = subduction zone. I = intraplate seismicity. This figure shows that slip partitioning is especially complete at subduction zones, fairly complete at rift margins, and not a big deal at transform boundaries. However, earthquake slip obliquity is very similar in all tectonic settings, suggesting there are some very fundamental controls on potential slip obliquity that may have to do with fault mechanics. Now, I have to admit that these two datasets are not completely comparable, in that the earthquake slip obliquity is calculated directly from the rake while the plate motion vectors are purely horizontal, and there are some simplifying assumptions I had to make when dealing with earthquake nodal planes, etc., so this could be more rigorous, but I think that the gross observations here are solid. What I find striking, though, is in a comparison of these two figures, and how in the same tectonic setting, different plate margins can show very different amounts of partitioning. Take the subduction zones of Sumatra and Chile, for example: though Sumatra is overall a much more oblique system, its earthquakes appear less oblique than Chile’s. It’d be interesting to look at each of the plate margins on earth, and compare their geology to the earthquakes and see what trends become apparent. Maybe I’ll start on this when the semester is over. In the mean time, I’ll take another look at the frictional modeling I started, and post that as well.